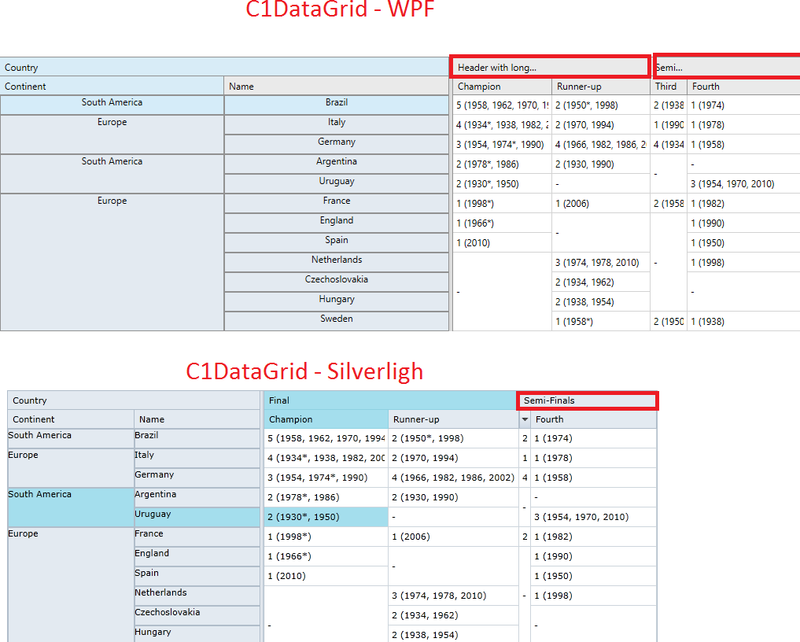 Can you please share the WPF sample demonstrating the problem? I would like to investigate this further. Yes, sure. Please see attached file and notify me as soon as possible. Thank you so much ! I attached again. Please get this new file. Header of MergedCell shows "Header with ..." instead of "Header with long content"
I have escalated the issue to the developers (Internal Tracking ID: 323945) and will let you know once there is any information from them. I have asked the developers about this. Will let you know once there is anything from them. 20 days passed, my project is using your control. How about this bug, please let me know! This issue has been fixed in an internal build. Would be available when the build is released publicly. When I can get your release public version? It will be released by the mid of next month. You can update to 2018 v2 build using C1Live.